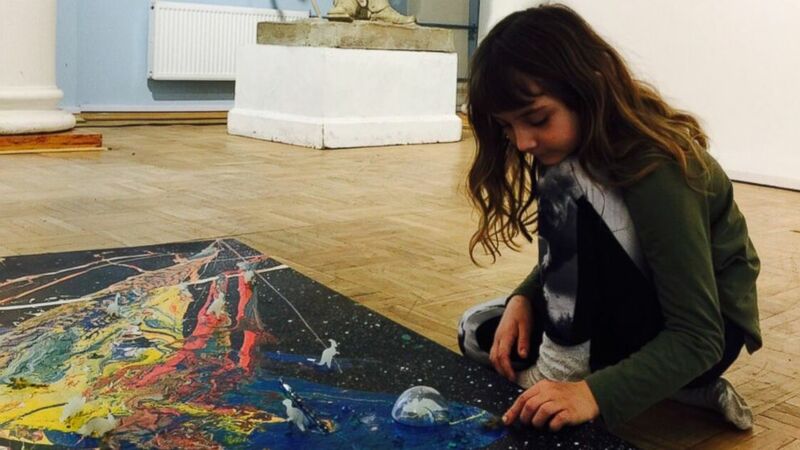 Meet the painting prodigy who started creating art when she was 9 months old. It started completely by chance. One day in 2007, Michael Andre of Melbourne, Australia, pulled out a canvas to paint. "The way I paint is with the canvas flat on the floor and sort of bending over it. I put some acrylic tubes of paint around it." he told ABC News. His 9-month-old daughter, Aelita, was on the floor too. She gravitated toward the canvas and started to press on the tubes. "Of course I was horrified, because you know how kids are. What if she will put it in her mouth?" said Nikka Kalashnikova, Aelita's mother. But Aelita never did that. 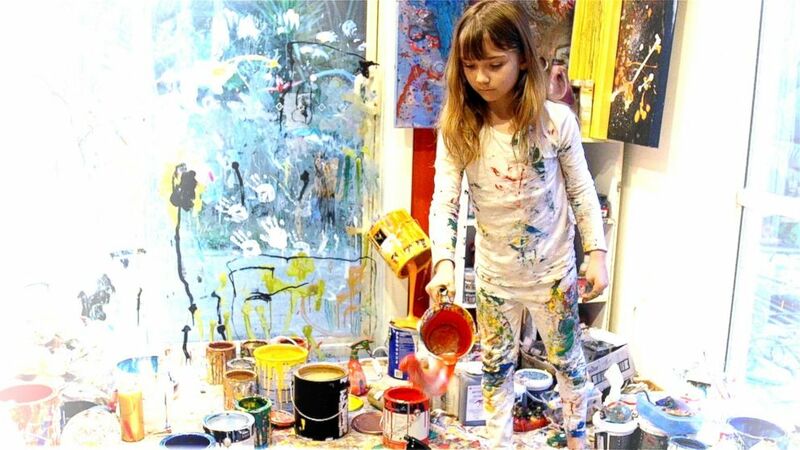 (Adam Rivera/ABC News) Aelita Andre at work in her studio nicknamed 'Aelita's Magical World'. Instead, the child moved the paint around the canvas and watched as the colors mixed and changed. "It was really fascinating to watch this creative process unfold in front of me," Andre said. "When I got up and looked at this square canvas, I kind of switched my whole perception of what she had done, from a child dabbling in paints to actually admiring the completed work." Aelita's work began to garner attention after Kalashnikova took it to a local gallery for an objective opinion. "I said to the curator, 'I'd like to introduce to you to this Russian female. What do you think about her work?'" said Nikka. "He said, 'Wow. I like it. That's really different. I don't mind exhibiting it,' And I'm just like, OK. I had heart palpitations." Since her first Melbourne show in 2008, Aelita, now 9 years old, has had exhibits in London, Hong Kong, Italy, and New York City. Her latest show 'Music of the Infinite' is at the Russian Academy of Fine Arts Museum in St. Petersburg, Russia. 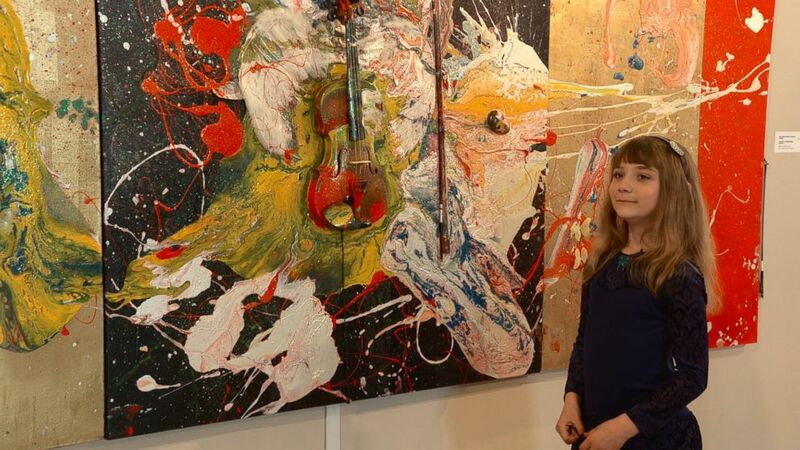 (Courtesy Nikka Kalashnikova) Aelita Andre pictured at the Russian Academy of Fine Arts Museum putting the final touches on her 'Music of the Infinite' exhibit. For Aelita, sources of inspiration can come from anywhere. "My animals inspire me, some of my movies. I don't watch cartoonish sorts of movies. I don't like that babyish films," she said. "Documentaries inspire me. The cosmos inspires me as well. Because it's a really amazing, magical place." (ABC News) Aelita Andre, 9, is pictured with her art at the Russian Academy of Fine Arts Museum in St. Petersburg, Russia. Aside from painting, Aelita exhibits a deep curiosity and connection to living creatures. Within the Andre household is a menagerie of animals. Flocks of finches and cockatoos fill the air along with the hum of several aquariums brimming with schools of fish and a lone axolotl. 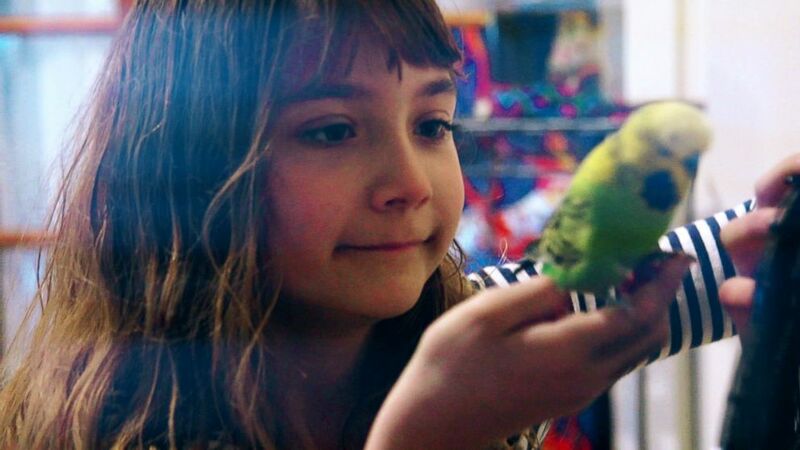 (Adam Rivera/ABC News) Aelita Andre pictured with Greengrass, one of her pet birds. There are also rabbits, guinea pigs and a resident lizard named Ruby. However, with her passion deeply rooted in painting, Aelita doesn't see a future without it. "I want to paint for the rest of my life. I never want to stop painting." she said. ABC News' Ben Brown, Tanya Stukalova, Max Karmen, and Angel Canales contributed to this report. For more stories from our "Young and Gifted" series, tap the bell icon on this story in ABC News’ phone app. Download ABC News for iPhone here or ABC News for Android here.